SuperFogeys - Details on the Kickstarter Campaign for the SuperFogeys Sourcebook and Adventure Game! We here at SuperFogeys Central are pleased to announce the Kickstarter Campaign to support the creation of The SuperFogeys Sourcebook & Adventure Game. This is something we’ve been working on for months now, in conjunction with respected game developer Team Frog Studios. 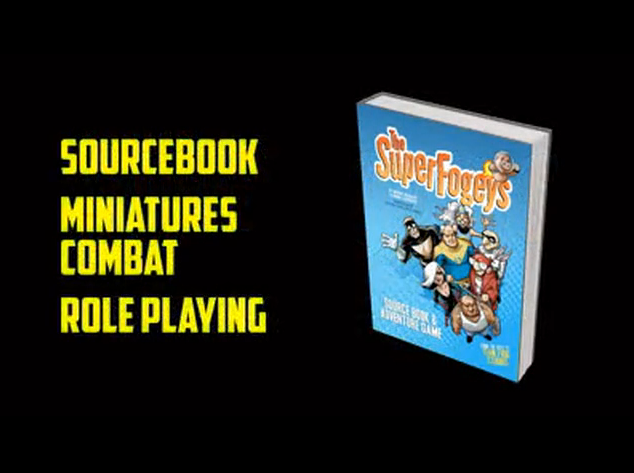 Back in April, the Team Frog guys approached me to ask if we’ve ever thought of doing a Roleplaying/Heroclix type of game with the SuperFogeys. They thought with the number of characters, powers and possible scenarios inherent in the SuperFogeys universe, the possibilities were endless. I agreed and we were off! Now, we’re at the point in development where we want to involve all of you. The Kickstarter campaign allows us a chance to really show off the game before it comes out and fund it in a way that will allow us to make the game bigger and better then we could do on our own. This isn’t just a book–miniatures of Captain Spectacular and Dr. Rocket are already in the works (pics coming very, very soon!) and the possibility of creating miniatures of other characters is there–but only if we meet our goals. That’s where you come in. Our initial goal is $3,000. Some of the great rewards available include a pdf of the game book, a printed copy of the game book, both the Captain Spectacular and Dr. Rocket miniatures, a copy of SuperFogeys Vol. 1, original Marc Lapierre SuperFogeys sketches, an appearance in a SuperFogeys strip and a Brock Heasley SuperFogeys sketch. Some of these rewards are in EXTREMELY limited supply, so you wanna act fast. But don’t worry, lots more rewards are on their way. FANTASTIC rewards. You’ll see. Even if you’re not much interested in the rewards, but just enjoy SuperFogeys and want to help out, you can pledge as little as $5 (and even then you’ll get your name printed in the PDF version of the book!). So what the heck is a “Sourcebook” anyway? Basically, it’s a book that will collect and reveal lots of details about the SuperFogeys universe and its characters. Want to know what city Valhalla is in? How about Swifty’s origin? Or maybe you just want to know exactly how Jerry’s powers work. I’m spending a lot of time personally writing the bios and stats for characters both major and minor and I think any SuperFogeys fan is gonna find the answer to something they’re curious about inside. Plus, yeah, it’s a game! With the scenarios and character statistics and instructions inside, you’ll be able to build your own role-playing game. More details on that and some sample pages are coming. This Kickstarter is just getting started. Full, currently available details are at the Kickstarter site. Check it out!